We definitely got a late start to the morning on our last day in Lisbon and by the time we headed out, it was already pretty hot out. 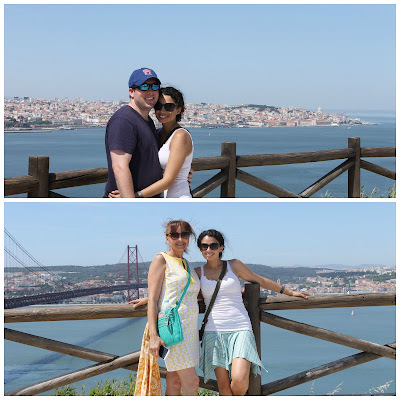 The weather in Lisbon had been perfect the whole time we had been there...sunny and breezy with clear, blue, cloudless skies, but on our last day there, it was hot. We decided to take the water taxi to Cacilhas to see what was on the other side of the river. Well, once we were there, we decided to go up to see the Cristo del Rey. When I say up, I mean UP. We tried to tak, we the light rail, but it didn't really look like there was much around, so we went back to the dock and followed the signs and walked hiked only to later realize that the light rail brought us half way there. It was a long, long, long walk up to the top and we all got a little cranky but when we got to the top, it was 100% worth it. The views are breathtaking and the Cristo del Rey is magnificent. All week, I had seen it in the distance, but you don't realize until you're standing at the foot of it, just how magnificent it truly is. 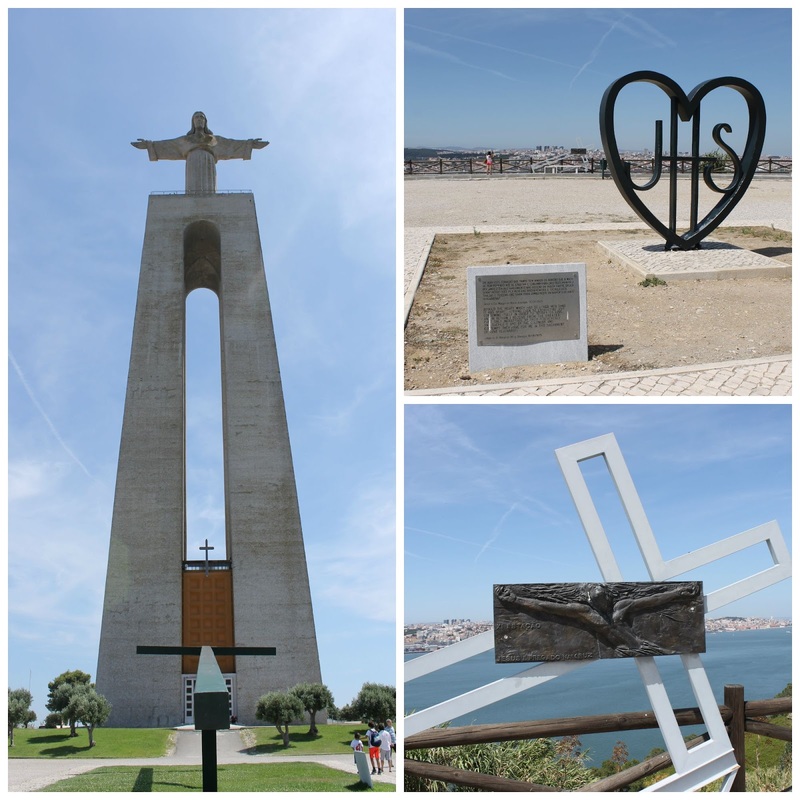 Portugal's Cristo Rey was built to praise God for sparing Portugal from World War II. 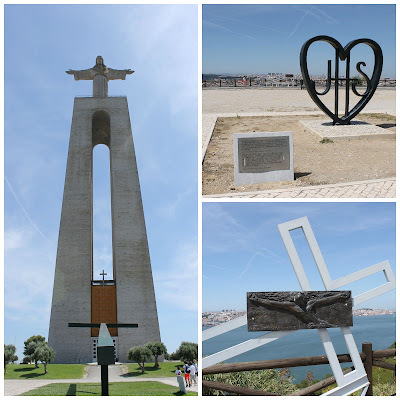 After a Portuguese cardinal had visited the Christ the Redeemer statue in Brazil, he went back to the Portguese bishops with the idea that, if they were spared from WWII, they would build this statue. We took the light rail back down to Cacilhas and the water taxi back to Lisbon (about a 5 minute ride) and made our way to dinner. 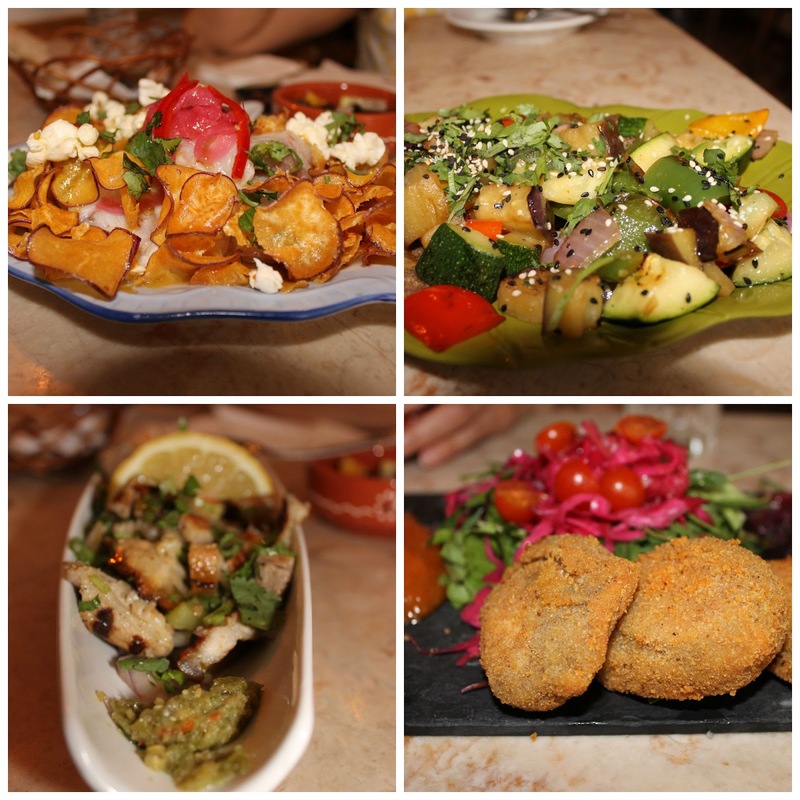 I had read about a tiny little restaurant called Taberna on Rua da las Flores so we went to check it out. Oh my goodness, it was the best meal we had while we were there...and considering I thought every meal was the best meal I had had, this took the cake. This place is a literal whole in the wall, but the food was heaven! We got there just in time because just as we were leaving, a line started to form outside the door. Taberna serves small plates, so we ate enough to fill us up without feeling too stuffed before heading to the Santini Ice Cream shop. 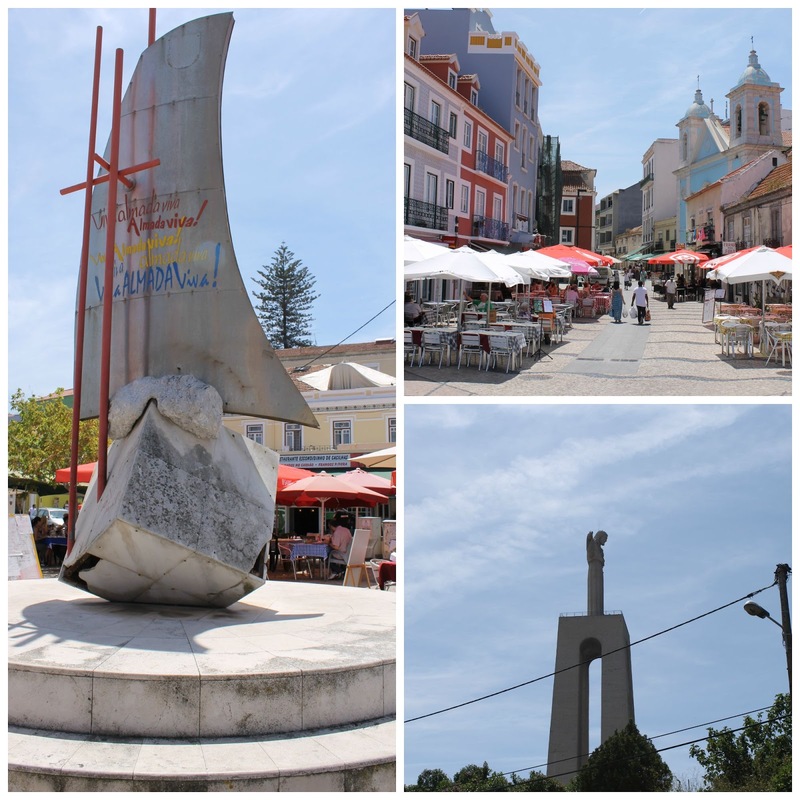 We had been to the Santini in the Ribeira Mercado, but the original was close by and we wanted The Pilot to taste the world's best chocolate cake! It was our last night in Lisbon and we definitely wanted to do it right so we did some major shopping, and then stumbled on a fabulous wine bar for some of Portugal's best wines. Yes, those are wine bottles across the ceiling. Coolest wine bar ever. As we were leaving, I realized that despite eating pasteles de nata like I was getting paid to, drinking basically an acre's worth of grapes, and eating a small river's worth of seafood, there was one thing I hadn't tried...ginjinha! Ginjinha is a sour cherry liqueur. I'm not a big fan of cherries, but I had to try it. The wine bar didn't carry it so we stumbled through Lisbon trying to find a place that had some and finally did. It kind of tasted like cough syrup mixed with a spoonful of sugar. Oh well. At least we tried it. After our ginjinha, we made our way back to our hotel, packed up the last of our things and got ready to say good bye to my new favorite city. Lisbon was incredible. I loved it so much that The Pilot and I very seriously contemplated going there for our anniversary. I have every expectation that I'll be back in Lisbon within a year. Yes, seriously...it was that amazing.